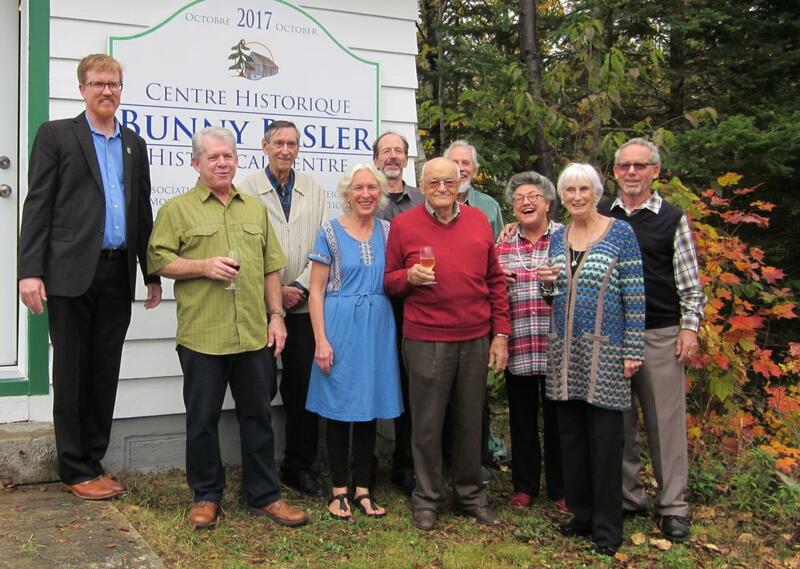 On Saturday, October 14th, the Morin Heights Historical Association(MHHA) celebrated the opening of the Bunny Basler Historical Centre at Basler Park, 75 chemin Lac Echo, on the outskirts of Morin Heights village. In spite of the gloomy weather, about one hundred people were in attendance and enjoyed sharing wine and cheese and viewing the outstanding renovations, done entirely by volunteers, to the small building which was the first aid station for the Basler family ski tow which closed over thirty years ago and is now a recreational site. The building, with some adjacent land, was donated to the Morin Heights Historical Association by Bunny (George) Basler, now one of Morin Heights’ oldest residents, who was among those first well- known skiers of the forties and fifties who helped in developing the ski-winter tourist industry in the Laurentians. Bunny has been a very strong supporter of local heritage and remains active in community affairs. The Centre will house the MHHA’s now considerable archive of photos, pertinent literature about Laurentian history, ephemera and some interesting objects – including some “natural heritage” such as a stuffed porcupine sitting on a giant fungus. The building will be used for research purposes (by appointment) for association meetings and for exhibits on local historical themes.